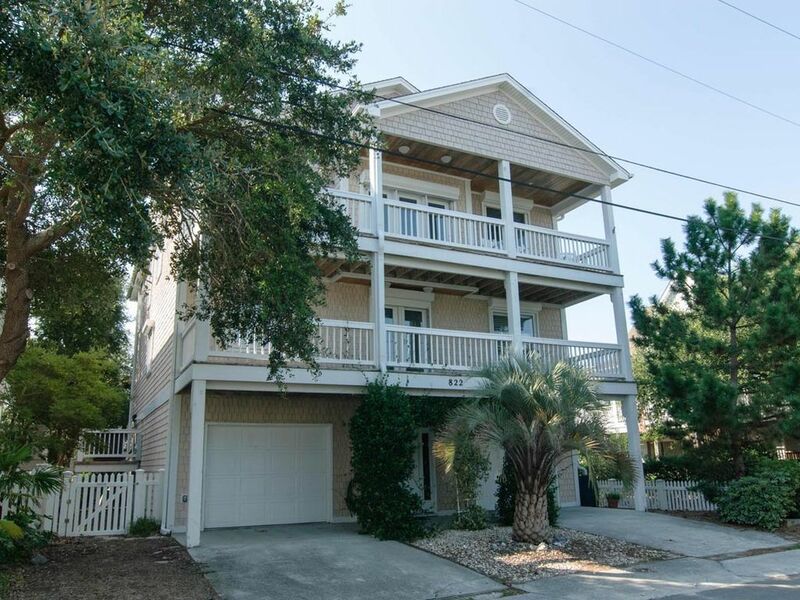 Profitez d'un séjour spécial Wrightsville Beach est cette exceptionnelle 5 chambres 3. 5 salles de bain maison unifamiliale située sur une rue sans issue tranquille à l'extrémité sud de l'île souhaitable à distance de marche de l'océan et du son. C'est un endroit idéal pour faire du vélo, ou se promener au bord de l'océan et explorer les magnifiques dunes de Masonboro Inlet. Il y a une zone désignée comme sanctuaire d'oiseaux - les enfants s'amuseront à observer la nidification - mais ne les dérangez pas s'il vous plaît. Le niveau de vie principal de la maison est au dernier étage avec un design ouvert salon / salle à manger / cuisine, chambre des maîtres avec salle de bain privée, baignoire jacuzzi et salle d'eau. Il y a beaucoup de fonctionnalités supplémentaires telles que les planchers de liège dans le salon, les appareils Kitchen-Aid Architect 11 et les comptoirs de quartz. L'étage inférieur a une deuxième chambre principale et 3 chambres supplémentaires. Entre chaque chambre il y a une salle de bain Jack-n-Jill. Il y a plusieurs porches couverts à l'avant et à l'arrière de la maison, avec l'arrière supérieur offrant de superbes vues sonores. Il y a un ascenseur à tous les niveaux pour votre commodité. Douche chaude / froide dans le garage. Parking pour 4 voitures. Occupation: 10. Interdiction de fumer. Pas d'animaux de compagnie. La cheminée est non-opérationnelle. After years renting from Bryant, I was shocked at the lack of response to our several calls & a visit to report broken items. After 3 days of waiting, someone did come, but was unable to fix anything. Ice maker in upstairs refrigerator broken - not fixed for the 2 weeks we were there. Had to buy ice. Microwave part broken from unit exposing fan - not fixed. Light over toilet broken - it was not the bulb. Internet service out for 3 days before someone finally came to fix it & had to go buy a new part to install later. Hose used to wash sand off of feet had broken nozzle. Michael we appreciate you giving us this feedback. We at Bryant Real Estate take pride in the way we handle our customer service and the high standards we expect from our staff, so it saddens me to see we fell short during your stay. Reviewing the work orders I do see that it appeared the router was struct by lightning, and parts had to be ordered for the microwave, but it was functioning at the time. We hope you had a nice vacation and look forward to seeing you next year. Property & location were great. This was our third year there. The biggest complaint I have is with Bryant R E. They started hounding me to pay advance deposit @Thanksgiving 2016?Then hounding me to pay rest of installment on May 1 for a July rental. In short Bryant R E was obnoxious! We apologize that you felt "hounded" by us. Each year we take advance reservations for guest that want to lock in their rental property before it goes on the open market. This is done well before our rates are set - at this point, you are not under contract with us or the owners. Each year we publish the rates in November, however, we give you until Mid January to decide if you want to agree to the published rate, or release the property for open market. We do this because we realize over the holidays, money may be tight, but we also want to provide the rates early so while with family, groups can decide how to proceed. We show that we contacted you on January 19th, a few days after the contract/payment due date to see if you wanted to confirm the booking. You did so over the phone by authorizing a credit card payment. Additionally, final payment was due 60 days before your arrival. This was a new structure for this year, we used to require it 30 days before arrival, but if you were to cancel at this time it would be hard to re-rent the property with only 30 days left. The change to 60 days ensure sufficient time to re-rent the property and would result in fewer losses to our guest and homeowners. In your case, we contacted you to collect payment in accordance with the contract you signed, but you asked for more time to make the payment, we adjusted your due date by 30 days, giving you sufficient time to make your payment. We apologize if you felt hounded in this process, we thought we were more than agreeable with the multiple extensions we made to the contract you signed. I see that you have rebooked for next year and I hope we can facilitate a smoother vacation for you and your family! Overall great, we are renting next year! Could have been a little cleaner upon arrival. Looks as of they rushed to clean. Our rental homes' dishwasher stopped cleaning. Repair man came the next work day. Said he'd contact the owner for replacement approval. He came back that afternoon to say he had approval and would replace it the next morning. That day passed and no DW or contact from Bryant. I called them and they had no idea why he had not come. Said they'd research and call me back. They didn't so I called again the next day. Same answer with no return call. He showed up that afternoon and explained that the owner wanted to upgrade and he had to wait for the upgraded DW to come in. Why didn't Bryant know that and tell me- or give me the repairman's contact info? We had 10 people, no dish drainer and kept wondering whether to get paper supplies! Communication would have helped. Kitchen was not equipped for hand washing dishes as we had to! When we arrived, we reported that many dishes were in the cabinets and drawers with food stains on them. I expect Bryant to be more aggressive in checking on these issues. The owners were kind and said they would refund a small portion of our rent. Hi Ellen- thank you for your feedback. We are sorry to hear you had so many issues during your stay, and we apologize for the lack in communication. We have been working hard in the off-season to make sure our team is well-equipped and trained to handle all issues this summer more effectively than ever. We hope you will consider Bryant Real Estate when planning your next trip to the beach! Very comfortable and well stocked with a very home-like feel. Balconies on both sides create spaces for privacy, quiet conversation. Property was clean with the exception that the walk through from the garage to the patio was cluttered with yard tools and paint cans and the propane tank fir the grill was empty. Management brought a tank and checked on water leakage from heavy rains within two hours of reporting. Family enjoyed fishing, swimming at beach and sound just a short walk away, and found beach treasures in woks each morning. We would definitely rent at this location again. We thoroughly enjoyed our stay as described in the guest book at the house. The house was immacualte, the sunrise and sunset views were spectacular from the porches, and the quiet, friendly location could not have been more hospitable.